Enroute Spa is a holistic day spa located conveniently in the Indianapolis International Airport. We started in 2004 in order to bring our passion for wellness to our community. Since then, we've launched a product line & event services to bring our brand to you wherever you are. Taking care of our "own" is an underlying philosophy of Enroute Spa. We are big into local sustainability and support that through our Hip and Handmade in Indy retail program, we are intense about making wellness convenient by bringing our services to your office, to your convention and to your special event. And we are serious about keeping that ethic of wellness going through the creation of our all-natural body care line - the Enroute Spa Collection - that allows you to have an authentic aromatherapy experience where ever you are without the toxic junk most products contain. In 2009, we were the only retailer in North American Airports to be honored for our green-initiative (ACI-NA). We built our airport spa with planet-friendly materials from renewable, sustainable resources and recycled materials. Our operational philosophy is focused on local sustainability. We help cultivate small-local handcraft companies by selling their handmade goods in our store through our Hip and Handmade in Indy retail project. 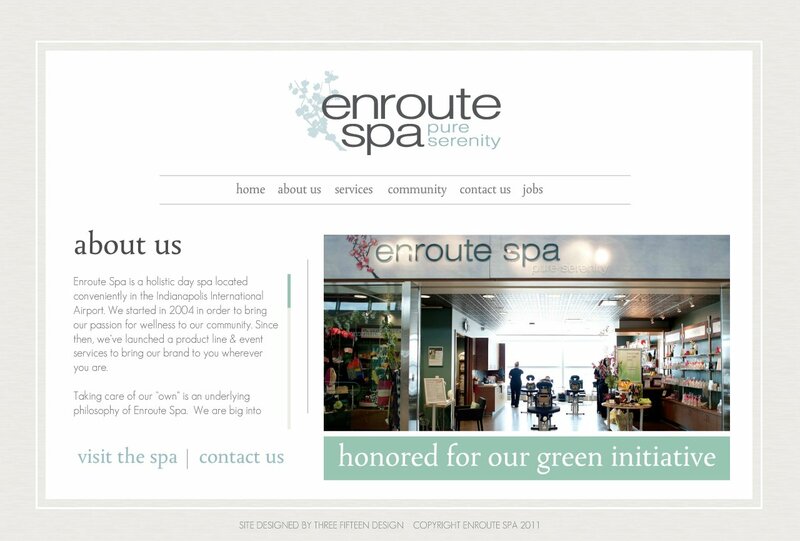 The Enroute Spa Collection is handcrafted right here in Indy, reducing our carbon footprint. Supporting local business keeps more money in the local economy and expands the local tax base which ultimately creates more jobs. Supporting the handcraft movement allows us all to move toward "producers of culture" instead of "consumers of culture". Many of the Hip and Handmade in Indy products are one-of-a-kind, or made from upcycled, recycled and renewable materials from the most delightful and talented artists. The spirit of Enroute Spa is about our people, the community, and the planet… we take care of our own and we have a great time doing it!